Having looked at the top ten boys’ names in the US for 2015 in this post, we now turn to the top 10 girls’ names for the US in 2015, according to the data released earlier this month. Emma: This classic British name gets its roots from Old German, via the element ermen or irmin, used as a first element in many compound names. Such compound names were often reduced to diminutive form by truncating the second element, result in Irma or Erma, which in turn developed into Emma. The name was used throughout Germanic Europe in the early part of the Middle Ages, but it only remained popular in England, due to the high regard with which Queen Emma, queen consort of England, Denmark, and Norway in the 11th C, was held. The name developed its own hypocoristics, with Em(m)ot(t) and Em(m)et(t) being used. Both of these read as masculine names nowadays, but Latinate forms such as Emota or Emmetta would both work as feminine names in the 21st C.
Olivia: Olivia is an Italian or Latin form of Olive, and Shakespeare is often credited for the use of the name in England. This is not the case. While Oliva may have been a more common Latin form of the name, variants Olivia and Olyvia can be found in England as early as the 13th C.
Sophia: With roots going back to the ancient Greek word for wisdom, σοφία, and the name of some early Christian martyrs, it’s no surprise that Sophia has been used widely for a very long time. It was never especially popular in the Middle Ages, but examples can be found from Brabant and France to Latvia and the Ukraine. Interestingly, we have not yet found any examples of the name in England; Withycombe s.n. Sophia notes that the name came into use there in the 17th C, along with other Greek virtue terms such as ἀλήθεια ‘truth’ and χάρις ‘love, charity’. Ava: This extremely popular modern name has a curious history. It is likely from Old German avi, of uncertain origin and meaning, and is only rarely evidenced medievally. Instead, its diminutive form Avelina (and variants) takes the stage as a relatively common name in France and England. We recently did an in-depth search for examples of Ava at the request of a reader, and were surprised at how few instances we found! Isabella: This Latin form of Isabel itself derives from Hebrew Elizabeth, via the Old Provençal form Elisabel, which was later interpreted as el Isabel ‘the Isabel’. The name first shows up in the 12th C, and while in some parts of Europe its connection to Elizabeth was quickly lost, in England even in the 16th C you can find examples of the same woman recorded in one context as Isabel and another as Elizabeth, and spellings such as Elizabella, Elsabel, etc., show the difficulty in confidently ascribing these forms to one name or the other. Mia: It’s not often one can point to a precise origin for the use of a name in the US, but Mia may be one such name. The first best-known example of the name is Mia Farrow, whose birthname was Maria. So far, we have found no evidence for this contracted form before 1600. Abigail: Abigail was essentially unused before the middle of the 16th C, and became quite popular, in certain circles, afterwards. It isn’t uncommon to find the name spelled with two ls during that period, which would make a lovely, slightly unusual variant spelling nowadays. Charlotte: There’s no doubt that the popularity of this name was influenced by the birth of a new princess, but interestingly, Charlotte itself is a relative late-comer into the pool of English names, first introduced in 1626 (see Withycombe s.n. Charlotte). It is a diminutive form of Carla, the feminine of Carl (cf. Charles), and can be found before 1600 in both France and Italian (though there this diminutive took the form Carlotta). It is curious, given how popular Charles was throughout the Middle Ages, how unpopular the feminine form appears to be. Harper: This is our first non-given-name (in origin, at least) on the list. Like Mason in the boys’ top 10, this surname was originally an occupational byname, deriving from Old English hearpere ‘harper’. The same byname can be found in England spelled Harp(o)ur, from Anglo-French harpour or Old French harpeor. We’re pleased to announce the publication of Edition 2016, no. 1 of the Dictionary. While this edition doesn’t add as much breadth as previous ones — though our geographical coverage now extends to Iceland — it contains quite a bit more depth, across all regions but particularly the Ukraine, Wales, Italy, and Brittany. This edition has 1812 entries (up from 1700 last edition), 661 women’s names and 1144 men’s names, with exactly 40,000 citations spread across those entries. Many of the new entries are ones that we’ll highlight in the special topic for this month: Protestant names in English, Dutch, and French contexts. The names of Protestants are uniquely marked out by their use of previously obscure Biblical names, particularly from the Old Testament, and we look forward to exploring Hezekiah and Isaiah and Josaphat. You want nicknames? We got nicknames! In dictionary entries, we sort our citations by modern day country borders (because trying to ascertain which country certain towns were in at which period is quite a bit of work — especially when ‘country’ isn’t a viable geographic category for much of the Middle Ages!). One particularly interesting aspect of the multi-cultural/cross-geographic data that we have is that it allows us to trace certain patterns or trends across these boundaries, and one such pattern is the prolificness (or not) of diminutives. We touched on this in the previous post when we briefly commented on the percentage of names that are diminutives in any given era. In this post, we thought we’d explore this further, with some stats and some bar graphs; it’s been too long since we’ve had a nice graph! The four outstanding areas are Estonia, the Czech Republic, Finland, and Italy. We’ve already discussed the nicknames in Estonia and the Czech Republic when we covered German and Slavic forms; so next up, we will explore diminutive and nicknames forms in Finland and Italy. What is fascinating about diminutive suffixes is how you can trace linguistic contact and language relationships through diminutive forms. We saw that in our previous post, with the similarity between German and Dutch diminutives, and we will see it again when we look at the French diminutives -el and -in. In this post, we look at Slavic diminutives — suffixes used in Poland, the Ukraine, and the Czech Republic — which share a clear relationship with Low German -ke(n). We concentrate on the two most common suffix types: -ko and -ek for men and -ka and -ek(a) for women. As with the German suffixes, these show up in Latin contexts at least as early as the 13th C. [1,2] But unlike some of the German diminutive forms, which for the most part were rarer than the root names, Slavic diminutives often eclipsed the root name in popularity — for example, in the Czech Republic, diminutive forms of Judith far outstrip the full form. In what is now modern-day Czech Republic, the suffix -ka was often spelled -ca (especially in Latin contexts where k was often avoided) or with an added sibilant, either before or after the \k\, resulting in -zca, -zka, -kza, etc. Examples of this include Anka (from Anne) and Elsca, Elzca, and Elzka (from Elizabeth). Often, this suffix was added not to the full form of the name, but to a hypocoristic from — as in the forms of Elizabeth just noted. In particular, native Slavic names were often truncated before the diminutive suffix was added, as we see in the names Sdynka, Zdincza, Zdinka (from Zdeslava) and Budka, Budcza (from Budislava). As a result, it can be often difficult to identify what the root name is, which is the case with many of the masculine examples we currently have. Given their linguistic and geographic context, masculine names such as Boczko, Czenko, Daszko, Luczko, Parcko, Raczko, Steczko, and Wyrsko are almost all certainly diminutives, though as of yet we haven’t yet confidently identified the root names. Our data from Poland, at this point, is still relatively limited, but even amongst the handful of diminutive forms that we have, we can see the influence of the Slavic construction in forms such as Ludeko (from Louis), another example of which we find in Lübeck a few years later. What we tend to see more in our limited Polish data is similarity with German suffixes, in particular one which we didn’t discuss in our previous post: -el. When we discuss German masculine diminutive suffixes, we’ll return to this! Finally, let’s look at Ukraine. As with Poland, our data from the Ukraine is still quite limited, and yet, even amongst that limited data we have a surprisingly large percentage of diminutive forms (making up nearly 7%!) . We see both the -(z)ko and -ek suffixes in this data, as witnessed by Iaczko (from Jacob), Iwanko (from John), and Muszyk (root name not yet identified), on the masculine side, and Marsucha (from Mary) on the feminine side. One must be leery of drawing any strong conclusions from the limited data that we’ve gathered so far. Nevertheless, even in this small data set we have ample illustration of the variety of ways in which diminutives could be formed, and evidence of their popularity. Artsikhovskii, A. V., et al. Novgorodskie gramoty na bereste, Vols I-VII. Moscow: Izdatel’stvo Akademii Nauk SSSR, 1953-78, no. 348. Moroshkin, Mikhail. Slavianskii imenoslov ili sobranie slavianskikh lichnykh imen. Saint Petersburg: n.p., 1867, p. 124. 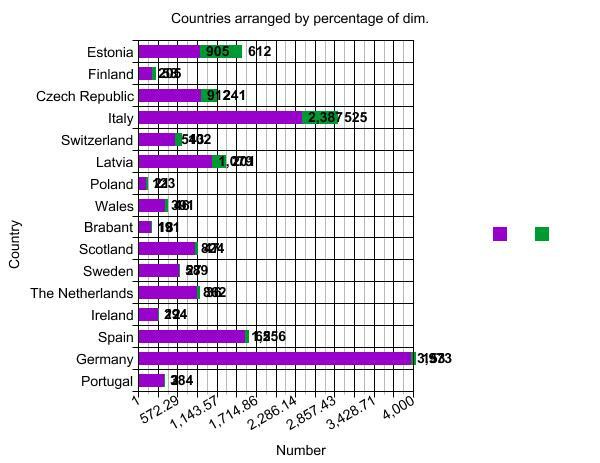 Compare that with, say, England or Spain, where diminutives make up 3%, or Sweden, where it is 4%. We’re combining blue and purple into one post because of the difficulty there can be in knowing just how to classify one interim term that gave rise to a number of different names: violet! Violet itself is of Old French origin, and thus its primary use is in places with connections to France. In the 16th C, it was quite popular in Scotland. The root word is Latin viola, itself used as a name. In connection with a research project on the roots of Shakespearean names, the editorial team specifically investigated this name before the publication of the current edition, finding out that it was unexpectedly popular in Hungary, Poland, and Ukraine. It wasn’t only the Latin word for the flower that was used in names; the Greek compound of ιολη ‘violet’ and ανθος ‘flower’ was used, recognizable in the modern spellings Yolanda and Violante. These tended to be used more in western Europe than the Latinate counterpart mentioned above. The next two names that fall under this post’s purview also have a connection with flowers. Greek ὑάκινθος was the name of both a flower and a precious gem of blue color, probably sapphire, and gave rise to both masculine and feminine names. Hyacinth was used intermittently in France, Italy, and Portugal; there was also a Polish saint by the name so while we haven’t found any Polish examples yet, this is due more likely to the fact that we have yet to start in on Polish names in any systematic fashion (the current edition has only 107 citations from Poland) than anything else. Hyacinthe was somewhat rarer; we have, to date, a single example from early Italy. Finally, we have one surprise: Indigo. The word, referring to a blue dye imported from India, only entered the English language in the 16th C, so its occurrence as a given name at the very end of that century, in England, is extremely unusual. It’s also a name well worth considering for modern revival — unusual, but recognizable, and evocative of lovely things. We’re pleased to announce the publication of Edition 2015, no. 3 of the Dictionary, the last edition planned for this year. The new addition has over 1700 entries (up from 1359 in the previous edition), with over 35,900 citations (more than 8,000 more than the previous edition). There are 633 feminine names and 1083 masculine names, and two of uncertain gender. This edition broadens our coverage to the following regions/countries: Ireland, Portugal, Brittany, Wales, Lithuania, Ukraine, and substantially deepens our coverage of the following countries: Spain, Sweden, Switzerland, Austria, Poland, Estonia, Finland (as well as having new citations for Italy, Germany, France, England, etc.). Come, spend a few minutes browsing, maybe you’ll find a new favorite name, such as Belhonor or Frotbald or Llywellyn, Wistrilde or revisit old favorites to see what new and unusual spellings you can find.